ESD Ionizer with Heater Controls Static Electricity! Perfect for electronic manufacturing, vacuum forming operations and more! Heated function helps control thermal shock! 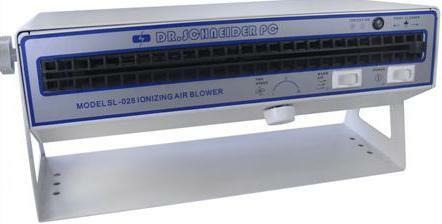 The SL-028 esd bench top ionizer is a robust and versatile unit that provides a wide plane of ionized air to control static electricity. This powerful yet easily controllable ionized air stream is PERFECT for electronic assembly and removing the final traces of static from insulative objects and sub assemblies. Excellent for use in all types of manufacturing operations and environments including plastic sheet and vacuum forming operations, pharmaceutical manufacturing, food processing and more. One of the most versatile ionizers in the industry! Variable temperature heated and ionized air output! Controls the accumulation of static electricity and reduces thermal shock to product! Powerful 70 to 120 CFM WIDE output, an outstanding value! Adjustable heated air output for reduces thermal shock! Precision +/- 10 volt offset voltage balance! Powder Coated Stainless Steel finish. Tungsten long life emitter. Minimal, VERY LOW maintenance! CE Certified, fully Warranted and Built to last a lifetime! The SL-010 meets or exceeds the recommended technical requirements of ANSI/ESD S 20.20- 2014 tested in accordance with STM3.1.